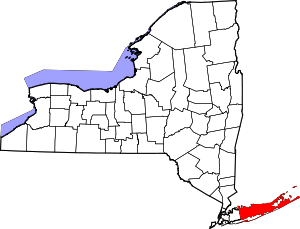 List of the National Register of Historic Places listings in Suffolk County, New York. This list is intended to provide a comprehensive listing of entries in the National Register of Historic Places in Suffolk County, New York. NRHP applications for New York State sites (Note, interface works best with Microsoft Internet Explorer browser; click on "Results" after searching to see the results). This page was last edited on 6 August 2018, at 22:34 (UTC).